Here are 11 things we learnt about Rahul Gandhi’s style of functioning from former Union minister Jayanthi Natarajan’s November 2014 letter to Congress President Sonia Gandhi. On Friday, former environment minister Jayanthi Natarajan quit the Congress party, after mounting a scathing attack on Congress Vice President Rahul Gandhi, claiming that she followed his directions on environmental nod to projects but was "vilified, humiliated and sidelined" by the party high command -- or, in this case, "the highest level". Natarajan, a fourth generation Congress leader from her family, said that it was "extremely painful and very heartrending day" for her when things have to come to a position where she has to disassociate herself from the party. In November 2014, she had written to Congress President Sonia Gandhi listing her grievance at the manner she had been treated by the party, for which she got no reply. Not only has her (external link) letter not been responded to, it has also not been rebutted. Here are some facts about the Congress and United Progressive Alliance II’s functioning we could glean from Jayanthi’s damaging missive. On December 20, 2013, (the then) Prime Minister Manmohan Singh called Jayanthi to his office and asked her to resign. He said ‘Jayanthi, I have been told by Congress President, that your services are required for party work,’ she writes in her letter. ‘The next day my resignation was headlines in the media, and all the initial reports correctly reported that I had stepped down for party work. By the afternoon, to my shock, I received information that persons from the office of Shri Rahul Gandhi were calling the media and planting stories that my resignation was NOT for party work,’ Jayanthi writes, adding, ‘My sources were impeccable.’ Thereafter, she says, the media was flooded with negative stories about her. Rahul Gandhi replied to her saying he was ‘running a little busy’ and he would meet her a little later. In the first week of January 2014 Jayanthi managed to secure an appointment with Congress President Sonia Gandhi, and explained to her the agony she had been facing since being asked to step down as minister and over the attack she has been facing in the media. Sonia told her, Jayanthi writes, that as the Lok Sabha elections were coming up she was required for party work, barring her specifically from going to the media with her side of the story. From then till November 5, 2014, when Jayanthi wrote to the Congress president, neither was she given any party work nor was she allowed to meet Sonia. Jayanthi writes in her letter that in January 2014, she got a sudden call from Ajay Maken, head of Congress’s media cell, saying she has been removed as the party’s panel of spokespersons and other work would be assigned to her, as per the decision taken “at the highest level”. Jayanthi points out that this was done despite her having served as spokesperson defending the party for 10 years, through the time when her mother was suffering from brain tumour. ‘I also feel that I have been pressurised and used to lead issues which I considered wrong,’ writes Jayanthi, and points to Snoopgate, on which she was called upon to attack the BJP’s (then) prime ministerial candidate Narendra Modi, causing her ‘great agitation’. She initially refused, since she felt the party should attack Modi on policy and governance, and ‘not drag an unknown woman into a controversy’. ‘Shri Maken telephoned me on November 16, 2013, while I was on tour and asked me to come to Delhi immediately to address a press conference on the issue. I expressed my disinclination to do this, and refused the assignment, mentioning that I was a minister at that time, and this should not be taken as the point of view of the government. Not only this, even after the press conference, throughout the controversy which followed, Jayanthi says she was told by Maken to fiercely attack Modi on TV channels and during debates, although I was otherwise never fielded in the media after appointment as minister. Fortunately for her, Jayanthi, says, her decision was upheld by the Supreme Court. The same happened with Adani projects, too, Jayanthi says, where she faced tremendous criticism from within the cabinet and outside, for stalling investment at a time when the country was going through a difficult time in terms of the economy. ‘The complaints of the local fisherfolk and NGOs of environmental violations in the Adani case were forwarded to me by Shri Rahul Gandhi’s office, and I was told to liaise with Shri Dipak Babaria in the matter. Occasionally, I apprised Shri Rahul Gandhi of steps I had taken, and he responded positively,’ she writes in her letter. M Veerappa Moily, who succeeded Jayanthi as environment minister, put her green orders on hold, writes Jayanthi. On November 3, 2014, G K Vasan quit the Congress in Tamil Nadu. While the party put up a brave face in a state where it exists more on paper than on the ground, the fact was that it went into a tizzy trying to find out who else will join him. 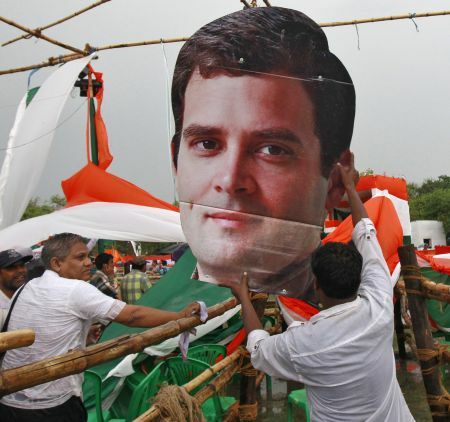 Images: (Top) A Congress worker holds a cut-out of Congress vice president Rahul Gandhi. Photograph: Rupak De Chowdhuri/Reuters. 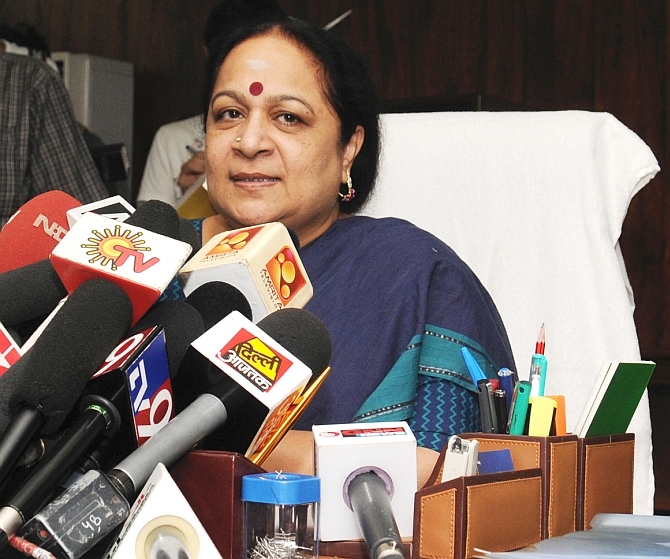 (Above) Jayanthi Natarajan addresses a press conference in Chennai on Friday.